Have you ever wondered how architecture sounds in Chinese? 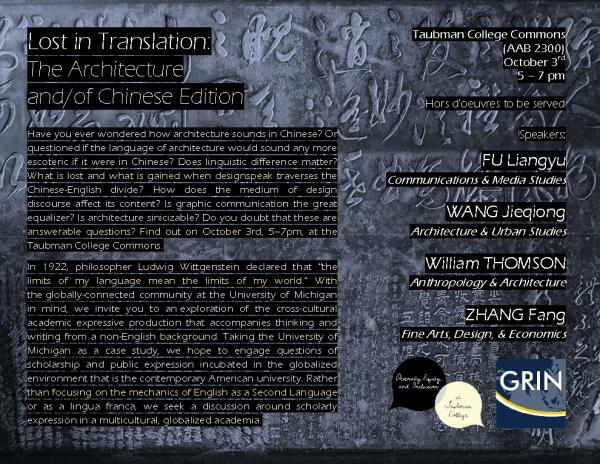 Or questioned if the language of architecture would sound any more esoteric if it were in Chinese? Does linguistic difference matter? What is lost and what is gained when designspeak traverses the Chinese-English divide? How does the medium of design discourse affect its content? Is graphic communication the great equalizer? Is architecture sinicizable? Do you doubt that these are answerable questions? Find out on October 3rd, 5–7pm, at the Taubman College Commons. In 1922, philosopher Ludwig Wittgenstein declared that “the limits of my language mean the limits of my world." With the globally-connected community at the University of Michigan in mind, we invite you to an exploration of the cross-cultural academic expressive production that accompanies thinking and writing from a non-English background. Taking the University of Michigan as a case study, we hope to engage questions of scholarship and public expression incubated in the globalized environment that is the contemporary American university. Rather than focusing on the mechanics of English as a Second Language or as a lingua franca, we seek a discussion around scholarly expression in a multicultural, globalized academia. Hors d'oeuvres to be served. No registration is required but please RSVP so we can provide enough food for everyone. This event is organized by GRIN with generous support from Rackham and in partnership with Taubman College DEI.